A single death is a tragedy; a million deaths is a statistic, is a well-known quote – often mistakingly attributed to Stalin. Regardless of the author, the sentence is interesting because it can be read in at least two ways: in one, it relates with compassion fatigue, our inability of feeling outrage when the horror surpasses a certain threshold. But it might also be seen as pointing to our inability to visualize and grasp the meaning of huge data amounts. When numbers are too high, the mind struggles to make sense of them. If, instead of a single number, you deal with large datasets, it’s difficult to find meaningful patterns that characterize them. It’s what’s happening now, in all kind of disciplines, from astronomy to neuroscience, archaeology, history or economics: every single minute, the world generates 1.7 million billion bytes of data, equal to 360,000 DVDs. How can we make sense of it? In fact, we largely don’t. Our mind alone, even with the help of computers is simply not equipped to take this challenge. Or when it is, it would take too much time to do so. But what if we could present the data in a way that’s more “empathic”, closer to the way in which we usually address the world? That’s exactly what scientists at the CEEDs (which stands for Collective Experience of Empathic Data Systems) project, a consortium of 16 partners in 9 European countries, are trying to do. 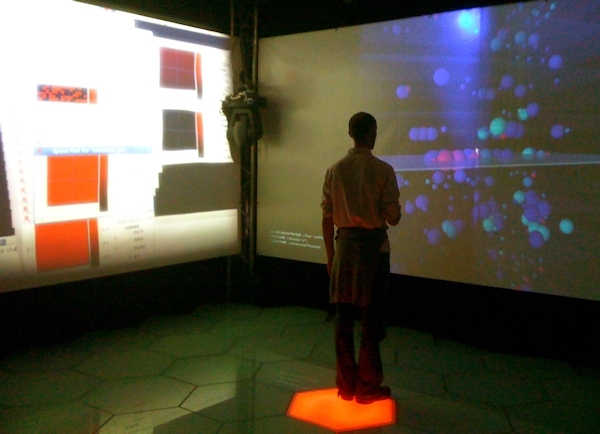 Using the eXperience Induction Machine (XIM), an immersive multi-modal environment located at Pompeu Fabra University in Barcelona, they are trying to use virtual reality to enable users to ‘step inside’ large datasets. Since, as they say, an image is worth a thousand words, you may want to have a look at the video [here], to see how it works. Once the user is wearing the virtual reality headset inside the induction machine, datasets are presented in various shapes and formats, to make it easier to understand them. Not only, but since the world’s indeed a stage – like that famous poet used to say – but it’s also a mirror, the visualization changes according to the user’s reactions. If something interesting catches his attention, the scene’s focus is modified accordingly. And here comes the interesting part: it doesn’t have to be a conscious reaction. Rather, scientists are looking for clues that come from the unconscious (or subconscious) mind. Before consciousness reaches the brain, the body is often already aware that something’s happening. CEEDS therefore plans to look for signs of discovery or surprise in these subconscious processes, using wearable technologies that measure people’s reactions to visualisations of large data sets in SR environments. According to Jonathan Freeman, Professor of Psychology at Goldsmiths, University of London and coordinator of CEEDs, the system also acknowledges when participants are getting fatigued or overloaded with information; if it’s necessary, it simplifies the visualisations so as to reduce the cognitive load, or guides the user to areas of the visualization that are not heavy in information. CEEDS covers a broad range of specialist fields. At Leiden University, for instance, [researchers] are trying to use the program to improve the virtual reconstruction of ancient Greek cities. Since 2012, the technology is also used at the Bergen-Belsen memorial site in Germany to reconstruct the history of the Nazi concentration camp, and there are also ongoing discussions with museums in the Netherlands, the UK and the United States to use it for the 2015’s commemorations of the end of World War II. Other possible applications of this new way of approaching big datasets, include building up a virtual retail store environment in an international airport and the visualization of soil quality and climate in Africa in order to assist local farmers in optimising crop yields. “Anywhere where there’s a wealth of data that either requires a lot of time or an incredible effort, there is potential – Freeman says”.